The Little Shop On The Corner. Whatever happened to the corner shop, oh hang on, that’s right…it turned into Woolworths 😦 I remember a shop (not on a corner though) across the road from my primary school. It was quite small. Little wooden steps lead to a big solid wooden door, wooden uneven floors. Boy did they have a great selection of lollies. You could stand there and choose the lollies you wanted and the shop keeper would get the tongs out and put the chosen few into a little white paper bag. Most of the lollies were half a cent each but the good ones were 2 cents each. Being situated across the road from a primary school, that had over one thousand students, I bet they did a great trade before and after school. I just miss these shops. Sometimes you can stumble upon these little treasures on a drive well away from the cities. So I guess I should go for a little drive in the future and have a nice cuppa out the front of a nice little store that has wooden floors. And a lolly or two. 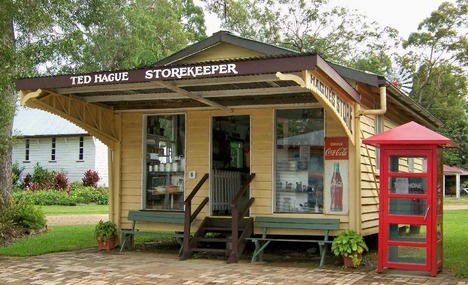 CABOOLTURE HISTORICAL VILLAGE, Queensland, australia.